Foregoing the British festive decorative tradition of “more is more” in favour of the Scandinavian monochrome look, our Christmases might look tame in comparison with others. To others they may look sparse, cold or even un-Christmassy. But where an abundance of light and colour can overload the senses, a more selective approach to decorating at Christmas can yield equally cosy results. Here’s a quick look at how I’ve styled our home for Christmas. It’ll come as no surprise to anyone reading this that Scandinavia is the primary source of my inspiration for the interior of my home: full stop. Monochrome interiors, stark whites, shades of grey and coal black touches here and there typify the genre of interior design. You’d think an abundance of black, white and grey would create a cold environment, but you’ve got to remember that this design ethos comes from cultures who are used to the cold and the darkness of winter. They even have words for cosiness that transcend what we take for granted in its meaning. In fact entire books have been written on the subject of hygge and mys that they’ve passed into the subconscious of coffee table discussion. There is no more hyggelig a time of year than Christmas and an absence of abundant colour does not mean an absence of warmth. This year in fact I decided to incorporate the teal of our Made.com Jonah sofa and armchair (last year I had them temporarily upholstered in black for the Christmas period). Colour is unavoidable – there’s the inevitable green of whatever tree or greenery you’re introducing, but then there are the inevitable colours of your furniture. It’s all about arranging what you have to create the mood or atmosphere that you want. On the coffee table I decided to create a winter forest of candles with Kähler hammershøi candle holders, my white tree from Flying Tiger, the tree candles I got from Denmark last October, the numerous tea light holders I got from H&M home and the Ittala Kivi. Dotted among the “trees” is a little plywood Moomin from Lovi, a stag and some DIY nisse I picked up from Søstrene Grene. The composition is designed to echo the “forest” of Ittala Festivo candle holders sitting resplendent on the sideboard. When the whole thing is lit the effect is extremely hyggelig. Our tree is a simple five footer decorated with home-made Himmeli made from black and white paper straws, the idea for these came from Nalle’s house. We’ve also made baubles from black and white patterns printed on card and formed into shape with wire (also from Nalle’s house). A single set of 6 wooden baubles break up the pattern white one set of 100 lights bring light to the tree. Sitting above the tree is our silver star decoration that we got from Home Bargains (of all places!). Clearly intended as a free hanging decoration, the star makes a perfect tree topper to complete the look. The trick when styling monochrome is to balance heavy and light tones. The easiest way of doing this is by combining tea lights such as glass votives like the Snowballs from Kosta Boda, with a repeated thematic focal point like the himmeli decorations on the tree, which then tie in with the geometric artwork on the walls like the print from Emerybloom, the Kubus candle holder or the Kähler Omaggio vase in the corner. Humour can be used tastefully throughout the arrangement too. As I mentioned in a previous article, the santa hat for the Kay Bojesen monkey was an absolute must while the presence of the white Hoptimist by designer Gustav Ehrenreich gives a breath of life to the stark colour palette. From the opposite side of the room from the tree, the piercing eyes of our Olle Eksell print gaze out across the room, while in the corner sits the Normann Copenhagen tray table, which I’ve mentioned about styling here. The monochrome shades of the pillows on the sofa and armchair sit beautifully against the teal. I’ve used the combination of a simple grey throw and plain grey cushions from IKEA’s GURLI range, a cushion that we recently picked up from Copenhagen (only 60 Kr!) and my Fine Little Day Gran cushion which keys in with the other patterns, holding the arrangement together. You’ll often find when styling a space that one or two pieces go on to influence a look for a space. The armchair sports a cute mountain cushion from Lagerhaus and the cross cushion from Zana Products. Monochrome doesn’t have to be oppressive or joyless. In fact I would strongly argue that it’s a smart and surprisingly dynamic avenue to pursue precisely because it runs counter to common consensus. The only drawback is that currently the UK doesn’t really offer much in the way of readily available monochrome ornaments or decorative pieces. Over here black is always paired with gold and silver with white and there the creativity ends. As such, much of my collection has been sourced from abroad. I hope you’ve found some form of inspiration to try something new next year. I’m always on the lookout for new ideas and regularly begin sourcing pieces in advance. Be daring, take the plunge and go monochrome. Emerybloom of Sweden are a small, online design company based in Malmö, Sweden comprising of Gareth Emery and Mysan Hedblom (hence the name). Established in 2014 they’ve gone from strength to strength over the past few years building on their original range of high quality geometric prints to include teas, totes, cards for different occasions and even beach towels! There are even a few Welsh inspired prints, a stylish nod to Gareth’s Swansea roots. Both Gareth and Mysan are Falmouth graduates who are artists in their own right but collaborate for Emerybloom. The look of the work is stunning, that’s worth getting out there before saying anything else. On trend, crisp and sophisticated, the prints make a bold and elegant statement with their sharp lines and distinct use of colour and geometric patterns. Their Christmas shop this year is full of new additions such as a new range of teas from Swedish brand Teministeriet in addition to new totes and a range of Christmas cards. Their new collection of cards features their signature geometric style, whilst taking inspiration from typical seasonal Scandi symbols, whether from a simple handwritten ‘God Jul’ (Merry Christmas) or the Finnish (and pan-Scandinavian) himmeli Christmas ornament design. Every year Emerybloom produce a limited run of a piece, the profits of which are donated to charity. This year their grey, fractal patterned Rudolph print sports the “God Jul” message at the bottom. One of many things I love about the company is their attention to detail and the quality of the individual elements. To be fair, we are talking high-end execution here, but it’s nice to know that everything from the quality of the paper to the choice of environmentally friendly envelopes has been thought of. Last year I styled their Rudolph print into the decor, which gives a sprinkle of traditional seasonal red whilst remaining stylish and paired-back. Seeing the himmeli cards and seeing as our Christmas décor is full of geometric, monochrome imagery (which definitely included himmeli) I had to get some. They came last week, I loved them so much I needed to have one framed – I’ve been waiting to show you guys how it looks, as I only picked it up on Saturday! It’s small, but bloody lush! I’d recommend a nice long peruse their prints, bespoke prints and Christmas shop. If you want some in time for christmas then order by December 10th! If you’re looking for something new to base a look around, or perhaps looking for a smart focal point for a room then perhaps Emerybloom has something for you. On Monday evening, perusing around Homesense with Tom, I came across this treasure trove of Scandinavian design. They had boxes and boxes of Normann Copenhagen design. I couldn’t believe my luck! The Agnes Vase, designed by Agnes Fries uses Handmade Chinese porcelain from Jingdezhen and combines & contrasts it with a top of black hand-painted brush strokes. 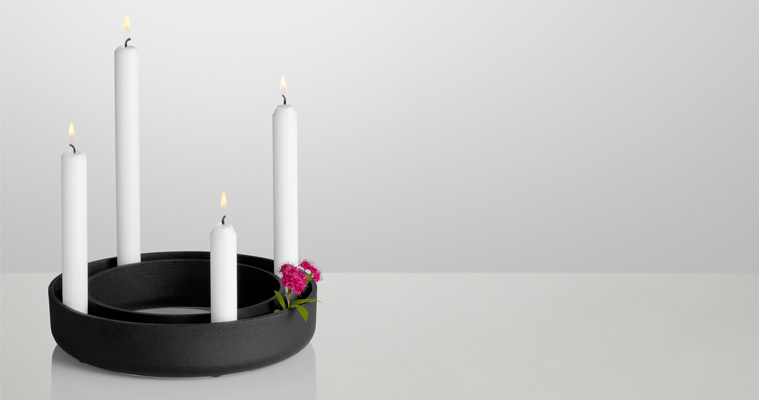 Its subtle yet striking, graphic and perfect for a monochrome/ Scandinavian styled interior. I decided to go for the 20cm vase, a Goldilocks among the rest in my opinion. Being ‘Not too big, not too small’ it doesn’t get swallowed up by a room, but it isn’t also too large to be a centrepiece on my small dining table, and at £6.99 instead of £39.99 I just had to get it! They also had the Floe tealight holder there in so many shades & hues. I picked up two considering they were £3.99 each in coral and dark green, perfect for both my Spring/Summer & my Autumn/Winter looks! Designed by the Spanish designer Ramírez i Carrillo to echo a traditional antique oil lamp, it gives a small but impacting atmosphere when styled into your interior. When I got home I immediately had to take them out of the boxes and incorporate into my Winter décor. the Agnes Vase looked perfect on my Normann Copenhagen Block Table, rubbing shoulders with some succulents & my Yule candle from Flying Tiger Copenhagen & Menu X Stokke Austad candle holder. I used a branch, that we had lying around from last christmas and adorned it with some of our homemade baubles & himmeli. I followed this tutorial by Nalle’s House to make the ornaments. It all fits so well together, with the vase completing the look. Not too ‘out there’ & Kitschy Christmassy. Monochrome, just festive enough & classy! The Floe fits perfectly on my IKEA side table keeping my little Tomte company. It looks great with the Sanna Annukka illustrated ‘The Fir Tree’ by Hans Christian Andersen underneath, strengthening the green and it also works well with the Iittala Aalto pieces, all creating a nice harmonious look. Let’s hope some Normann design is at your local Homesense store, but get it quick as it will vanish fast! … it dawned on me that it had a very Eastern feel to it, with its use of black cast iron and its circular form, it instantly reminded me of some Ikebana vases I had seen before. As we are doing up the master bedroom with a mix of Japanese and Nordic design – this was perfect! I decided on my flowers, chrysanthemums for the Ikebana arrangement, now I needed the all important foliage. After foraging on a walk with the Mr, I had collected the necessary elements to finish the display. After carefully arranging the fauna, I placed it on my IKEA HEMNES side table, along with an IKEA SINNERLIG jug, I had bought earlier that day. Speaking of the SINNERLIG collection, I just love it! Its a collaboration between IKEA and Ilse Crawford, the collection utilises natural materials like cork, which give it a very organic and understated feeling. It also has a slight Japanese feeling towards it, which just gives me life! Yesterday, was our second trip to IKEA of 2015 (we went a total of 8 times in 2014!) This time the goal was to get more napkins (as you know I love dressing a table with colourful napkins) and to get the BROMMÖ loungers for the garden. The BROMMÖ chairs had been on my internal design shopping list for a while, but as we did not have a house last year, it seemed a total illogical frippery to buy them (and to store them) – plus the Ikea in Cardiff – IKEA Wales hasn’t always got what the other Ikeas in the UK in stock, as it’s a smaller store. Anyway, I had been looking for some Mid Century inspired chairs for the garden, and we came across two options, the first being an Acapulco inspired chairs in Habitat, and the other being the BROMMÖ lounger. We decided on the BROMMÖ as Tom thought it was more comfortable. The BROMMÖ is built from accaica (stained with a Teak finish, for that Danish look) and Polypropylene rope. The chair is basically a Mid Century gumbo pot of Poul Kjærholm’s 1951 PK 25 and Han’s Wegner’s 1949 Folding Chair. Albeit an inspired piece (obviously an orignal would be lovely!) for £40 per chair, the form is pretty good! Although, I will have to keep on top of them, if I want them to last, by regularly oiling them and keeping them from getting bleached in the sun. The next item burning an ever bigger hole through our pockets was the Ikea LILLÖN barbecue. With its shiny black exterior (also available in green) and insect-ilke legs, this is definitely the Juicy Salif of the barbecue world. Giving off a Jetsons meets War of The Worlds vibe, it’s so Mid Century, you could imagine Don Draper cooking up some class A burgers on it. Plus it’s height is adjusted to 2 heights, one as a standalone barebecue for a cook-out, the other as a tabletop grill, for a picnic etc. For £90 we could get a bigger charcoal barbecue, but we just had to get it! We had also picked up some more napkins and a couple of Marimekko Sukat makkaralla inspired SKOJA glasses for the picnicware set, and a few other bits and bobs. Stocked up and checked out we then loaded up the car before having something to eat in the Ikea Cafeteria. It was surprisingly rather easy to get everything in the car- as normally it’s like the game of Tetris from hell. We then grabbed something to eat, the compulsory köttbullar with plenty of grädsås and lingonsylt, it is an Ikea institution, after all! And on the way back down, we had to stop at their Swedish Food Market for some pick & mix and some Påsk must. Yes, Påsk must, exactly the same as Jul must, but every time I see it I’m a sucker for it.